Custom Flatware Inserts Drawer shown 24" deep. Design varies depending on drawer depth. Exact Drawer Width*: 9 1/16" 9 1/8" 9 3/16" 9 1/4" 9 5/16" 9 3/8" 9 7/16" 9 1/2" 9 9/16" 9 5/8" 9 11/16" 9 3/4" 9 13/16" 9 7/8" 9 15/16" 10" 10 1/16" 10 1/8" 10 3/16" 10 1/4" 10 5/16" 10 3/8" 10 7/16" 10 1/2" 10 9/16" 10 5/8" 10 11/16" 10 3/4" 10 13/16" 10 7/8" 10 15/16" 11" 11 1/16" 11 1/8" 11 3/16" 11 1/4" 11 5/16" 11 3/8" 11 7/16" 11 1/2" 11 9/16" 11 5/8" 11 11/16" 11 3/4" 11 13/16" 11 7/8" 11 15/16" 12" 12 1/16" 12 1/8" 12 3/16" 12 1/4" 12 5/16" 12 3/8" 12 7/16" 12 1/2" 12 9/16" 12 5/8" 12 11/16" 12 3/4" 12 13/16" 12 7/8" 12 15/16" 13" 13 1/16" 13 1/8" 13 3/16" 13 1/4" 13 5/16" 13 3/8" 13 7/16" 13 1/2" 13 9/16" 13 5/8" 13 11/16" 13 3/4" 13 13/16" 13 7/8" 13 15/16" 14"
Drawer Insert Height*: 1 1/2" 1 3/4" 2" 2 1/2" 3"
Custom Built Drawer Organizer. 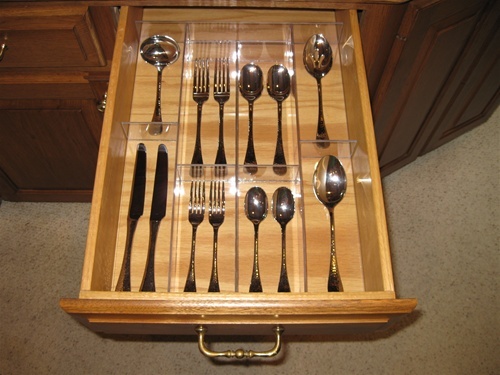 Great for organizing drawers in the kitchen. 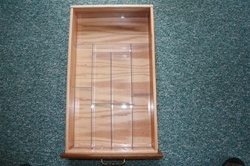 These drawer organizers are custom manufactured from clear polycarbonate. 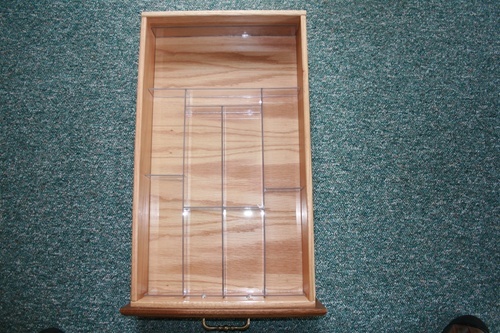 Organizers can be designed to fit you specification.